If one takes a deep look into the elements behind the music of Jacob Fred Jazz Odyssey, he or she might notice change is a prevalent theme. After seeing the Fred for numerous years, regular line-up changes and stylistic shifts have conditioned me to expect the unexpected. As the driving force behind each Jacob Fred Jazz Odyssey incarnation, pianist and composer Brian Haas remains the alone original member after co-founder and bassist Reed Mathis parted ways with Jacob Fred Jazz Odyssey in 2008. Since their arrival, new members Chris Combs (Lap Steel), Josh Raymer (Drums), and bassist Matt Hayes have not only kept intact the progression of Haas’ vision but have infused their own sense of playfulness that undeniably represents Jacob Fred Jazz Odyssey. A will to change is evident on the group’s latest release, Stay Gold, available on both vinyl and CD courtesy of Kinnara Records. For a group deeply rooted in jazz, Jacob Fred Jazz Odyssey takes a courageously unique step forward with Stay Gold. The album is unlike any sort of traditional or modern jazz I’ve heard…one might even consider the album rock & roll if the mood strikes. 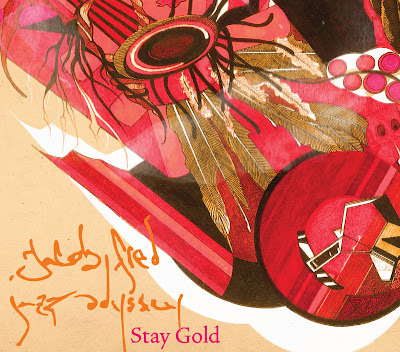 Unfortunately, overused labels such as these rarely serve justice to the beautiful offerings at hand; “Stay Gold” is drenched with spacious sonic explorations that travel far beyond any preconceived notions one might hold. A sign of a true musician, pianist Haas shows remarkable restraint by allowing Combs to lead the melody on his lap steel guitar for most of the album. Songs “Sensation of Being Light”, “Stay Gold”, and “Hamby’s Window” feature Comb’s slick pedal steel work while Haas fills brilliantly, constantly keeping the listener on his or her toes by introducing harmonic and tonal ideas throughout each musical offering. When not directly providing his voice, Combs provides versatility by creating both enormous and subtle sonic swells in order to fill the imaginative pockets created by Haas, Hayes, and Raymer. The delicate nature of Combs playing best shines through with his offerings on the more traditional “This Our Home”, and the spacious, polyrhythmic adventure, “David”. Although much praise should be given to each member’s contributions throughout “Stay Gold”, the most surprising and enjoyable element to the album is the presence of Josh Raymer’s pinpoint and thunderous drumming. As early as the first track, “Sensation of Being Light”, Raymer takes the reins to Jacob Fred Jazz Odyssey’s improvisational vehicle by constantly dropping huge fills and engaging in a musical discussion with bassist Matt Hayes that illustrates their respective wisdom beyond years. Whether Raymer is dominating the syncopated “Sensation”, the funky throwdown of “Hamby’s Window”, or the rockin’, energy-filled grooves found in “Trampoline Phoenix”, his work is never overdone. Raymer’s drumming voice not only echoes the power and touch displayed by jazz greats such as Roy Haynes and Jack DeJohnette, but also, to an equal extent, mimics the youthful, new-school swagger of a younger drummer such as an Adam Deitch. Staying honest to its inventive nature, Jacob Fred Jazz Odyssey has created another gem for its fans with “Stay Gold”. Those familiar with the Fred should be pleased by the group’s continuative efforts; newer listeners, in turn, will have a fresh opportunity to experience its soulful, indigenously American sounds for the first time. Recently in Oklahoma, the band presented its reinterpretation of Beethoven’s 3rd and 6th symphonies alongside the 44-piece Bartlesville Symphony Orchestra. Titled “Ludwig”, the band’s critically-acclaimed performance exemplifies its desire for continual change and innovation. “Stay Gold” is not merely an album…it is also a timestamp for a bright, forward-thinking group of musicians to call their own. Jacob Fred Jazz Odyssey should be proud of this accomplishment as those who listen will certainly be sharing the same emotion. Awesome review. Really nailed the spirit of the record. I'm proud to be from the same city as these talented gentlemen. Although, to be correct, Matt Hayes is the bassist on this album, and "Sensation of Seeing Light" is in 4. We'll get those corrects made stat. We appreciate your feedback and assistance.